Dear friends, long time no post! I have been off exploring the Yucatán and I have so much to share with you. This was my 4th trip to Mexico which officially makes it the country I have traveled the most. After visiting Mérida for a few nights (an amazing city! ), my compañero and I took a bus to Valladolid. This is a small city in the center of the Yucatán, but it is very important to Mexico’s history. It is also very warm there as it is completely surrounded by jungle. We arrived in Valladolid just in time to visit Casa de los Venados (House of the Deer). This is a private home which contains the largest museum quality collection of Mexican folk art in the country. There are more than 3,000+ pieces in this collection. The owners are kind enough to open their home every morning for a free tour (donations welcome!). I had read a lot about this collection of folk art and I was very happy to have the opportunity to visit! This 18,000 square foot home is really a palace complete with beautiful open spaces, fountains, gardens, and a swimming pool. I was amazed at the amount of art which was displayed in every room (there is even an entire room dedicated to Frida Kahlo). It is really a grand example of how one can make art appreciation a part of their daily lives. Of course, I was on the lookout for beadwork and I did find several pieces of Huichol bead art. Last year, I wrote a blog post about this art form which you can read HERE. Folk art acknowledges the importance of what is sacred as a unique expression of a people’s perception of the universe. These works of art are primarily handcrafted for utilitarian or decorative purposes. A folk artist might be self-taught, or learn from other folk artists to create their own authentic works of art. This is different from ‘fine art’ which is generally taught and legitimized in academies. 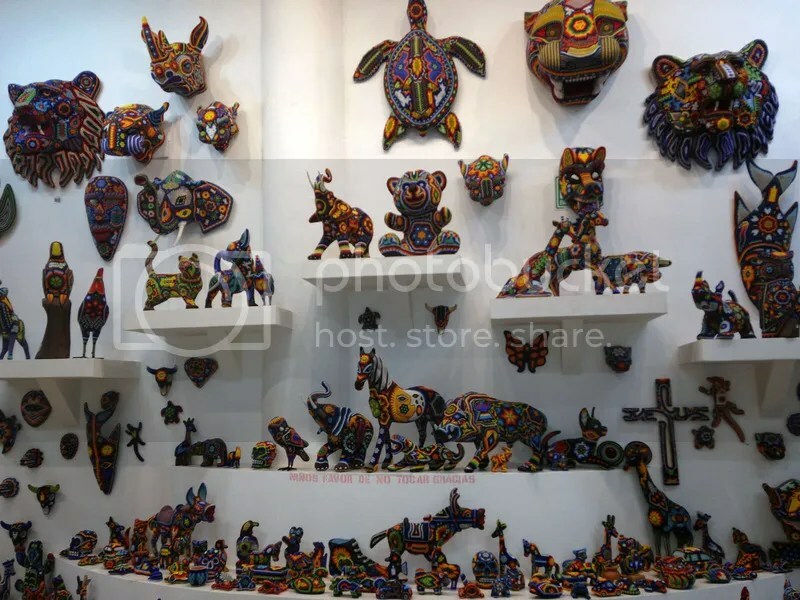 At Casa de los Venados, the goal is to share with the community and teach that folk art is indeed something which the Mexican people should view with pride. They now conduct organized school tours to teach children about the art and handicrafts of their country. This is wonderful because in many cases the local children might never make it to a big city to view fine artworks. They now have the opportunity to learn about and appreciate the art that is all around them. Dear friends, last month I traveled to Playa del Carmen, Mexico. This was my 3rd visit to the country. For those who have never had the opportunity to go to Mexico, I highly recommend visiting the Yucatan peninsula. This area is full of nature, handcrafted art, adventure, fish tacos, relaxation, and fun in the sun. For those who haven’t been there, I thought I would share a few photos of some beautiful beaded artwork I discovered along the way. 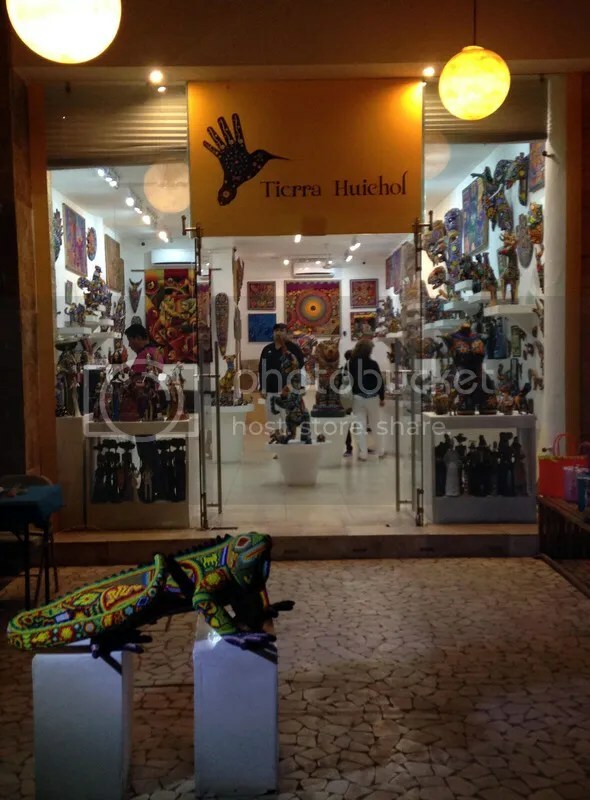 On my last night in Mexico, I visited Tierra Huichol, a gorgeous shop on 5th Avenue. 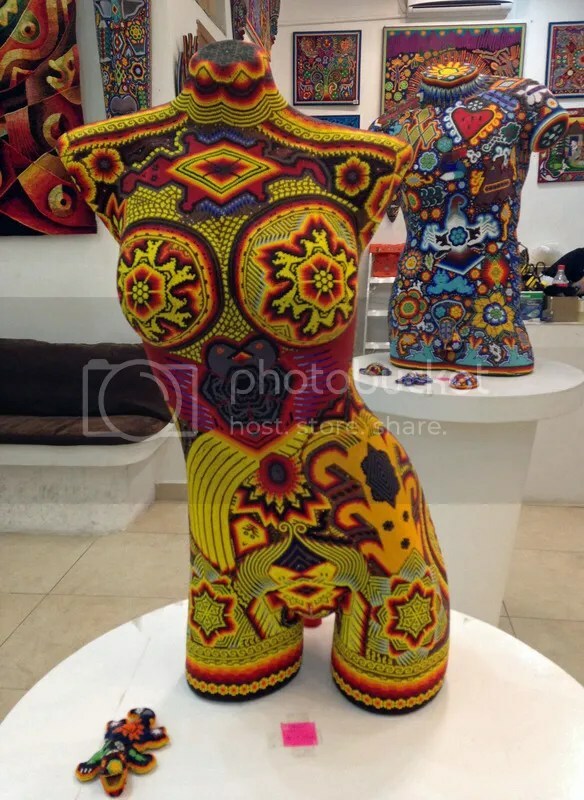 This shop carries colorful hand beaded artwork made by indigenous Huichol (pronounced Wee-Chol) artists from the Pacific coast states of Jalisco and Nayarit. I had the opportunity to speak with the shop owner, Carlos, and he told me a little about the craft. 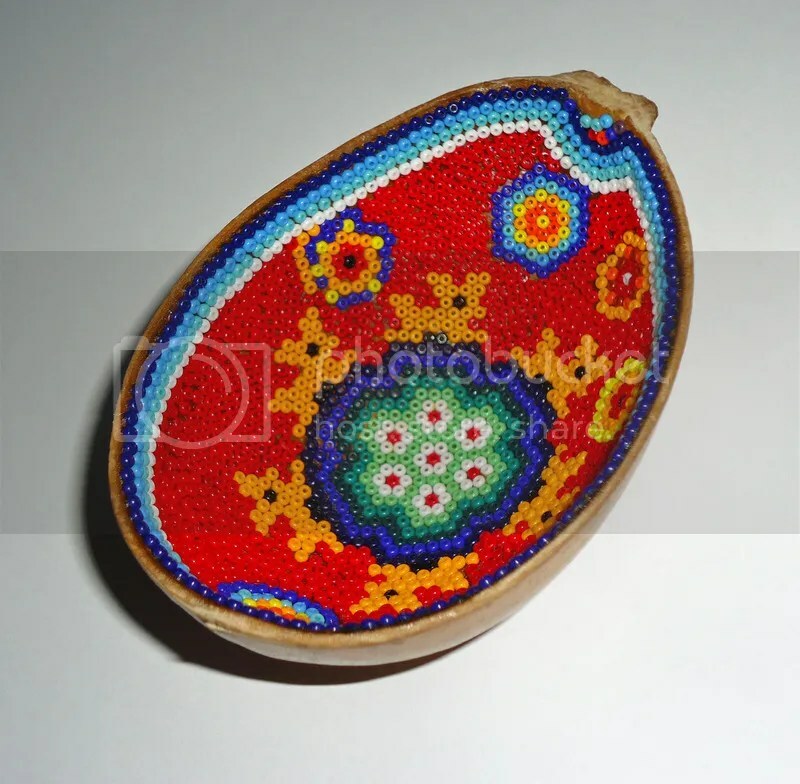 The Huichol people use mainly Czech glass seed beads because Japanese seed beads are just too perfect. First, an animal figure is covered with beeswax, then tiny glass beads are imbedded into the wax one by one to create these amazing designs. One of the main concerns is that over time, the wax may harden and some beads may fall off. I was told they are in search of a manmade material (similar to beeswax) which they can use to help reduce bead loss. I think the most impressive thing about this art form is that the artist does not use a drawing or outline to follow. They simply use their incredible artistic vision and creativity to create one of a kind pieces. 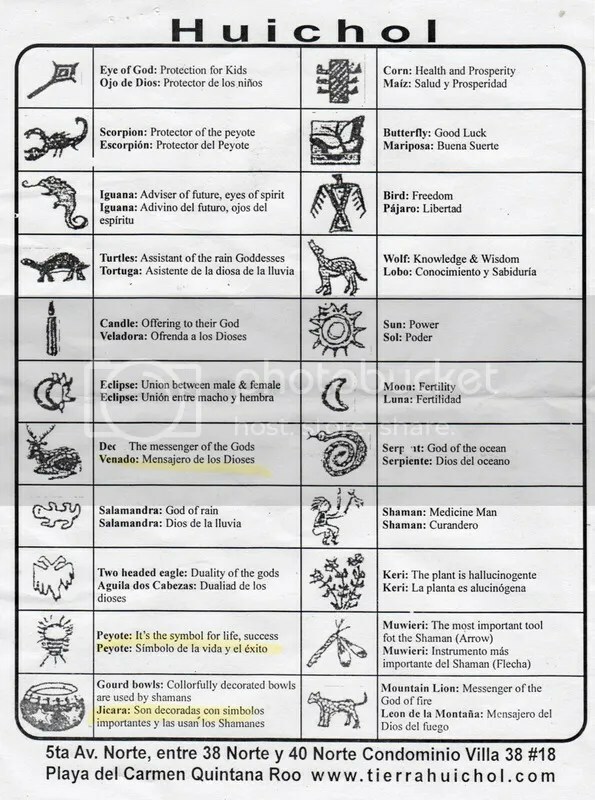 I was given the chart above to learn about all of the symbols which can be found in the artwork. Then I shopped around for awhile, and I found a small beaded gourd to purchase. This piece features images of the Peyote flower and the Deer.